However, the relative gains in wealth have been receding perceptibly for quite a time. 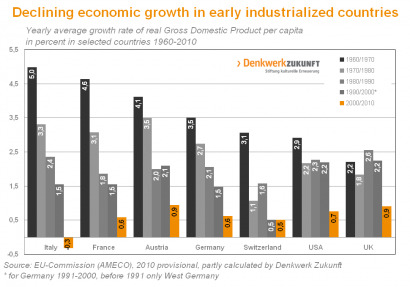 The real growth rates of the per capita GDP have been sinking steadily in nearly all industrialised countries. In places where the economy grew relatively strongly such as the USA or Great Britain, growth was financed on credit for a long time. Since the 1980s the saving rates of private British and American households decreased continuously. Shortly before the financial crisis in 2008, the British and Americans were spending nearly the whole of their disposable income on consumption. 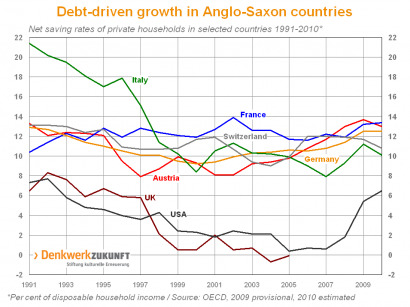 Consequently many private households now have debts which they are unable to pay. Many private American households will now have to reduce their spending drastically in order to align it with their incomes. Between 2007 and 2009 the household saving rate in the US increased from 0.6 to 5.4 percent and is expected to rise even higher.4 The declining consumption will have a considerably dampening effect on the dynamics of growth. 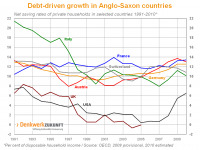 As already is the case in Germany and many other early industrialised countries, here too the net incomes of broad sections of the population will stagnate or fall.